View La Trobe River Basin in a larger map (opens new window). Fast flowing stream with rock and sand bottom. Contains abundant brown trout to 300 g, (av. 100 g). A small, narrow deep, tributary of the Moe River which contains small trout, less than 220 g, short-finned eel and Gippsland spiny crayfish. A small tributary of the Morwell River, gravel bottom. Contains brown trout to 240 g, average 80 g, short-finned eel and Gippsland spiny crayfish. Not heavily fished. 873 ha. 200,000 ML. Boat ramp, picnic facilities. A storage on the Tanjil River below the junction of the river's east and west branches. Boating permitted, but restricted to a maximum boat length of 4.3 m, maximum power of 7.5 kw (10 hp) and a speed limit of 8 km/hr. Good shoreline access for fishing on the western side. Contains abundant European carp av. 600 g and up to 6 kg, brown trout to 1.3 kg, (av. 700 g), redfin to 1.4 kg, (av. 440 g), goldfish and possibly some short-finned eel. Stocked regularly with brown trout. Australian bass stocking commenced in December 2002 and fish to 500g in good condition have been taken in netting surveys. Blue Rock Reservoir, near Moe, received 15,000 bass towards the end of 2010. It also received 22,000 the previous summer, providing two consecutive year classes in this water. A small lake surrounded by pine plantations. Accessible by Chessum Road, off the Rosedale-Longford Road and then via tracks through the pine plantations. Access requires some local knowledge. It was stocked with brown trout and rainbow trout 1987-90. No longer stocked and not recommended as a fishing water. A small creek with some deep pools in its middle and upper reaches. Flows through farmland, mud and gravel bottom. Occasionally stops running in summer and the lower reaches are badly silted. Contains some brown trout average 250 g, maximum 650 g, short-finned eel, Gippsland spiny crayfish, European carp, goldfish and congoli. Last stocked with trout by Fisheries Victoria in 1969. Tributary of the La Trobe River. Contains short-finned eel to 800 g, river blackfish to 100 g, abundant small brown trout to 250 g, Australian smelt and Gippsland spiny crayfish. A small tributary of the Moe River. Flows through farmland and the town of Warragul, 2-4 m wide, riffles 10-20 cm deep and pools to 60 cm. Stream partially blocked by encroachment of vegetation in some areas. Good habitat for small fish particularly downstream of Warragul. Contains small brown trout less than 220 g, short-finned eel, European carp and Gippsland spiny crayfish. Not heavily fished. 500 ha. 31000 ML. Boat ramp and open to boating. The lake has zones for various activities. Closed to boating several times a year for special events, check with the lake caretaker (5163 1566). This shallow warm reservoir in flat open country is a cooling water pondage for a nearby power station. Contains abundant European carp to 3 kg, eels and the illegally introduced, exotic aquarium species convict cichlid, spotted tilapia (formerly called the black mangrove cichlid), blue acara and the red devil cichlid. Trout stocking in this water was unsuccessful. Stocking with Australian bass commenced early in 2003, but was discontinued in 2008 due to water temperatures proving to be too high for this species (up to 360 Celsius). Lake Hyland is situated on the north-eastern outskirts of the town of Churchill and is part of the larger Mathieson Park. The lake can be accessed from Mackeys Road and ample parking is available. Fishing platforms are a short distance from the car park. Facilities include five fishing platforms with disabled access, a large modern picnic shelter with electric barbeques, picnic tables, toilet block, fitness station, children's playground and a walking track which encircles the lake. Most of the shoreline is accessible to anglers with the deeper sections of water to be found along the northern bank. The eastern side of the lake will be managed as a bird habitat, with plans of building hides for bird-watching enthusiasts. Managed as a Family Fishing Lake and subject to stocking with advanced yearling rainbow trout. Also contains redfin, European carp, short-finned and long-finned eels. Fishing methods include baits such as worms or corn fished either on the bottom with as little sinker weight as possible, or under a float cast out from one of the platforms. Small lures can also be used for the rainbow trout and redfin. Rises at Powelltown and flows for 20 km through native forest to Noojee. Very accessible from the Yarra Junction/Noojee Road. It is a shallow river (mostly less than 60 cm deep) 5-10 m wide, with a sand substrate. At Noojee, riparian vegetation includes grass, blackberry with some instream rushes. Substrate is rubble, gravel and sand. Instream habitat is common. The best fishing area is around Noojee with brown trout to 1.1 kg, (av. 400 g). Both brown trout and river blackfish are abundant. Other species are Australian smelt, short-finned and long-finned eel, shorthead lamprey and pouch lamprey. Flows in a wide valley through gently rolling farmland upstream of Willow Grove and flat farmland downstream. Riparian vegetation varies from scattered mature eucalypts and wattles, grass, or dense willow trees. Substrate is rock, gravel and rubble areas upstream, and sand downstream. Channel width varies from 7 to 13 m. There are extensive shallow riffle/runs 60-80 cm with deeper gutters and pools over 100 cm deep. River Health Program works involve willow control, and fencing, revegetation and stabilizing of banks. The streambed is open and exposed, with fish cover and habitat mainly along the banks. Contains brown trout, abundant river blackfish, short-finned eel, Australian smelt, shorthead lamprey, and downstream from Willow Grove, Gippsland spiny crayfish, European carp, redfin, tench and southern pygmy perch. The best fishing is in spring and autumn. The Hawthorn Bridge area downstream from Noojee has abundant small brown trout averaging 90 g.
A 1.5 km reach of wide (50 m), deep (5 m) water, mud bottom. Contains predominantly European carp to 4.5 kg, brown trout and short-finned eel. A few brown trout are taken on spinners. Flows in open, flat farmland. Riparian vegetation is usually willows, grass, occasional tea-tree, wattle or scattered red gum in various combinations. The banks are steep or often vertical and eroding, resulting in discoloured water and sedimentation of the bed. Channel width is 25-30 m with water depths varying from 1.5 to 2 m. Substrate is sand, mud or hard clay. The river consists of slow runs with deeper pools on the bends and occasional short riffles. Water temperatures are usually higher below the Power Station wall, than nearby waters, due to the release of warm water from the power station. Subject to flash floods. The most widespread and numerous fish are European carp to 5 kg, short-finned eel and Australian smelt. Other species are river blackfish, redfin, eastern gambusia, long-finned eel, common galaxias, southern pygmy perch, very occasional Australian grayling and congoli. Brown trout to 1.4 kg, redfin, black bream, luderick, yellow eye mullet and abundant estuary perch are caught in the river between Sale and Lake Wellington. There are reports of eastern dwarf galaxias, and Australian bass near Lake Wellington. Most angling in the La Trobe River downstream of Lake Narracan is for European carp. A small stream flowing through farmland, then several kilometres of forest, and finally 5-6 km of farmland to the Morwell River. Width is 2-4 m with shallow (10-20 cm) riffles and pools to 60 cm. Predominantly sand bottom. Good habitat (snags, pools and riffles) for small brown trout in the forested area. Contains brown trout to 530 g, (av. 110 g) short-finned eel to 1 kg, river blackfish to 100 g (av. 25 g), shorthead lamprey and small Gippsland spiny crayfish. Not often fished. Last stocked with trout by The Victorian Fisheries Authority in 1958. A clear, fast-flowing, shallow, mountain stream joining the La Trobe River at Noojee, mud, sand and gravel bottom. 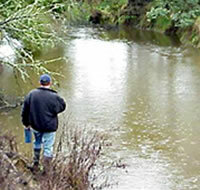 Contains abundant small brown trout (some fish to 600 g) river blackfish, Gippsland spiny crayfish and short-finned eels. A small gravel-bottom stream joining the Morwell River below Boolara. Contains brown trout to 330 g (av. 160 g), European carp, short-finned eel and small Gippsland spiny crayfish. Not often fished. A large drain, 10-15 m wide, flowing through flat farmland with mud and gravel substrate. Limited riparian vegetation. Some deep pools. There is a River Health Program to control willows and restore riparian vegetation. A very fertile water carrying predominantly European carp average 1 kg, (max. 3 kg), some tench and short-finned eel. Last stocked with trout by The Victoria Fisheries Authority in 1969. 30,300 ML. Not open to angling. A domestic water storage on the Tyers River. Contains European carp, brown trout, redfin and short-finned eel but all angling is prohibited. A small water (less than 5 ha) located at the southern edge of the town near Kernot Hall. Managed as a Family Fishing Lake and stocked with advanced yearling rainbow trout (See Introduction). Rises in steep open forest and then flows in a rock, boulder and rubble bed in a narrow valley to Boolara. Upstream of Boolara it is accessible from the Morwell River Road. Riparian vegetation is eucalypts, grass, willows, tea-tree and blackberry. Consists of a mixture of pools and runs with some rapids. Fish habitat is provided by willow roots, bank vegetation and woody habitat. At Boolara, the river is up to 10 m wide with extensive pools over 100 cm deep. Riparian vegetation is primarily willow. Further downstream it flows through flat farmland in a wide valley. Riparian vegetation varies from dense willows to mature eucalypts and wattles near Yinnar. Here the channel is 8 m wide with steep banks 4 m high. Willow control and bank fencing and revegetation are taking place as part of the River Health Program. There are shallow riffles (60 cm) and extensive pools over 100 cm deep. This area has some good habitat and is accessible for angling. Other sections, particularly in the lower reaches, have become badly silted up or channelised and provide little angling opportunity. A popular stream with local anglers as the upper section, particularly above Boolara has abundant brown trout and river blackfish and is good for fly fishing. Contains mainly brown trout to 560 g, but the average size is very small, also short-finned eel, Gippsland spiny crayfish, European carp, goldfish, congoli, river blackfish, Australian smelt, long-finned eel, flathead gudgeon, eastern gambusia, southern pygmy perch and shorthead lamprey. A small stream rising in hilly farmland near Thorpdale then flowing in cleared or lightly forested river flats. Catchment has been modified by agriculture. The stream is turbid and in many places choked by willows. Width varies from 2 m upstream to 5 m downstream. Substrate also changes from gravel upstream, to rubble and rock, then mud in the lower reaches. Riffles are shallow (20-40 cm) upstream but there are reasonable areas of deeper water (50-80 cm and occasional pools to 100 cm) with good habitat downstream. There is a waterfall on the creek 4 km downstream of Thorpdale. Contains a few brown trout av. 350 g, short-finned eel, small river blackfish, Gippsland spiny crayfish, eastern dwarf galaxias and Australian smelt. Not a popular fishing water. 300 ha. 7,995 ML. Boat ramp, camping. Formerly known as Yallourn Storage Dam, this lake has extensive shallows at the western end. Erosion in the catchment has led to the bottom becoming mainly mud and the water is turbid most of the time. Water level fluctuates widely. Contains mainly European carp av. 1 kg, (max. 5 kg), some brown trout to 500 g, redfin and goldfish. Mainly fished for European carp with corn and worms the best bait. Also used for boating and water skiing. Trout stocking was suspended in 1984 due to the very poor return to anglers. Stocked again in 1998 after the lake had been substantially drained. The turbid water and high summer temperatures make this lake marginal for trout. It is no longer stocked as returns are poor. Lake Narracan received a stocking of 20,000 Australian bass in 2010. A small tributary of the Morwell River, gravel bottom. Contains brown trout av. 200 g, short-finned and long-finned eel and small Gippsland spiny crayfish. Not often fished. Small stream containing brown trout to 320 g, (av. 100 g), river blackfish, short-finned and long-finned eel and Gippsland spiny crayfish. A small narrow deep creek with spawning habitat for trout. Contains small trout less than 220 g, short-finned and long-finned eel and Gippsland spiny crayfish. Not heavily fished. Last stocked with trout in 1978. Contains short-finned and long-finned eel, river blackfish to 130 g, congoli and brown trout to 300 g, (av. 90 g). Flows through flat farmland into the Moe River. Channel width varies from 2-4 m with bank heights 1-2 m. Riffles are 30-60 cm deep with pools up to 100 cm deep. Mud bottom with woody habitat. Riparian vegetation is grass and willows. Turbid water, instream cover and deep pools provide excellent habitat for biota. Contains short-finned eel to 825 g, river blackfish to 110 g, occasional brown trout to 550 g, (av. 110 g), long-finned eel, southern pygmy perch, eastern gambusia and Gippsland spiny crayfish. A clear, fast-flowing stream, rising in steep forest, rock, boulders and gravel bottom. Channel width to 15 m, riffles 50 cm deep and pools over 100 cm. Numerous small brown trout av. 120 g, with some fish to 680 g, abundant river blackfish, a few smaller rainbow trout, southern pygmy perch and European carp in the lower section near Blue Rock Lake. The river flows for 30 km to the La Trobe River mostly through flat farmland. Riparian vegetation is mature eucalypts, blackberry, grass and some willows. Channel width is 9-20 m. Predominant water upstream is riffles to 60 cm deep with only 6% of the river being pools to 100 cm deep. Substrate is rubble, rock and boulders with small patches of gravel and sand. Downstream the channel is deeper and flow is slower. Riffles are up to 86 cm deep and pools to 150 cm. Substrate are sand and gravel with patches of mud and rock. Contains predominantly brown trout to 780 g and occasionally to 1.4 kg, (av. 150 g), abundant river blackfish, good numbers of Gippsland spiny crayfish, European carp, occasional short-finned eel, redfin, Australian smelt, flathead gudgeon and occasional shorthead lamprey. European carp are most abundant near the junction with the La Trobe River. There is adequate trout spawning to naturally support the population and the water has not been stocked with trout since 1985. A clear fast-flowing stream, mud sand and gravel bottom. The valley is largely cleared but there is good riparian vegetation on the banks. Contains Gippsland spiny crayfish, brown trout to 400 g, river blackfish and shorthead lamprey. A small creek (4-5 m wide) flowing through mostly cleared flat farmland, rock and mud bottom. There is dense riparian vegetation of willows although some sections (Morwell Rd) have been cleared and replanted with native trees. Here there are deeper pools and some good habitat. Other sections are choked with instream willows resulting in small deep pools among the willow roots. Willows are being removed and replaced with native vegetation as part of the River Health Program. There is turbid water, sluggish flow and some sedimentation. Contains mainly brown trout av. 90 g, (max. 600 g), also short-finned eel, congoli, numerous river blackfish, some Gippsland spiny crayfish, European carp, southern pygmy perch, Australian smelt, shorthead lamprey and pouch lamprey. A popular water for bait fishing. Two fishing platforms have been constructed by the Catchment Management Authority, which has also undertaken a substantial program of removing willows, replanting native trees, fencing banks and establishing off-stream watering points for stock. A fast flowing stream running through flat farmland adjacent to steep forested country. Substrate is rubble, gravel and sand. Water is mostly runs and riffles with occasional pools. Abundant fish habitat from woody habitat and undercut banks. Channel width to 8 m. Access is limited to road crossings. Contains abundant brown trout av. 150 g, with some to 1.3 kg, abundant river blackfish to 130 g, Australian smelt and Gippsland spiny crayfish. A small (2-5 m wide) creek flowing in forested mountains. Riparian vegetation of native forest and ferns. Pools to 70 cm deep, formed by log jams and other woody habitat; riffles to 20 cm. Substrate rubble and patches of sand. Excellent fish habitat and cover. No survey data but probably contains the same fish species as in the upper Tyers River. A wide, shallow river (mostly 10-50 cm deep with some large pools to 100 cm deep). Flows through steep forest with riparian vegetation of blackberry and tea-tree. Substrate is sand in the pools and scattered rubble, boulders and rock in the riffles and runs. Contains short-finned and long-finned eel, brown trout to 300 g, (av. 80 g), Gippsland spiny crayfish, river blackfish to 150 g, European carp, shorthead lamprey and a good population of redfin which is unusual in this type of mountain stream. Accessible via the old Tyers-Walhalla Road. A small tributary of the Morwell River, gravel bottom. Contains brown trout average 140 g, short-finned and long-fin eel, some river blackfish and small Gippsland spiny crayfish. Not often fished.